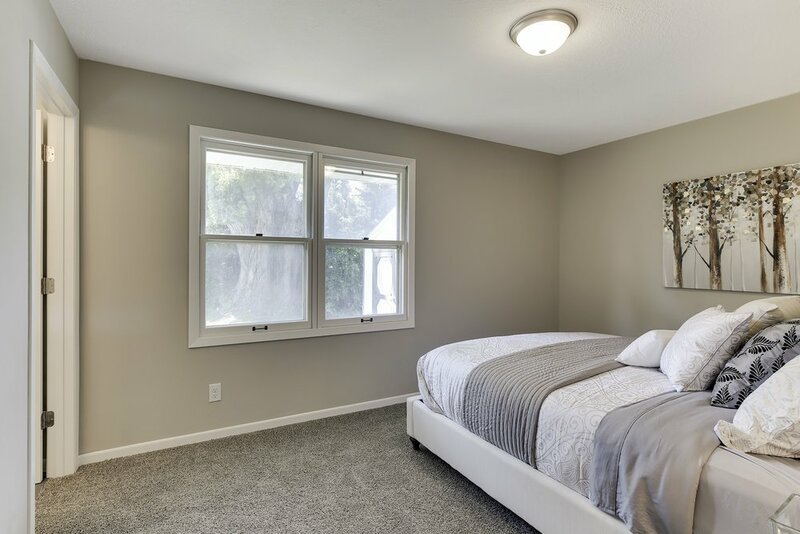 This master bedroom was once just a regular bedroom! By dividing what was once the single upstairs bathroom into two separate bathrooms, we were able to great a master suite. We added a door from the bedroom into the new bathroom, tiled the shower with a faux marble tile to make it look light and spacious. To see the full before and after video for this project, visit our Work page and scroll down to "10th Avenue SW". A mirror framed mirror added style and class to this bathroom! Three bulb vanity fixture adds flattering light for the whole space. A dark floor tile adds contrast and grounds the space. Faux marble porcelain tile has the classic look of marble while being maintenance free! Marble herringbone mosaic tile has a beautiful high class look for this small space. You can't go wrong with a classic shower head and trim kit.